Roe Rovers players celebrate scoring against Irish Street. Roe Rovers secured their seventh league win on the bounce with a dominant 7-2 victory over a struggling Irish Street side. The visitors knew it was going to be their day as they took the lead after just 20 seconds. A one-two between Paddy Logue and Chris Doyle resulted in the former finding Jack McGonigle in the box who, with a clever back heel, found Finbar O’Brien in acres of space and he made no mistaking drilling the ball into the bottom corner. Rovers would have liked to continue in that vein but within a couple of minutes, a stray pass from Doyle and a ball over the top, which the Rovers defence failed to deal with, led to Jonny Wilson equalising. The Limavady men settled into the game a bit more and they regained the lead on 20 minutes. Some neat play in midfield set Doyle away down the left who sent a low cross into the feet of Conor Mullan, he swivelled well and blasted home giving the keeper no chance. It was all Rovers now and they increased their lead after a neat ball over the top found Paddy Logue, who slid the ball past the keeper and in off the post to make it 3-1. Continuing to dominate, Rovers added a fourth goal from the penalty spot after Jack McGonigle was fouled inside the box, Doyle made no mistake with the resulting spot-kick. The Irish Street players’ heads dropped at this point and it was a case of damage limitation from here on in. Rovers continued to look like the only team likely to score but a seemingly innocuous long ball from an Irish Street midfielder was misjudged by Tommy Hassan’s attempted header which allowed striker Kyle Miller to slot the ball home past Rovers keeper Ryan Smyth. Rovers to their credit continued to look to find openings and that paid off on 30 minutes when Paddy Logue turned the ball home after a goalmonth scramble to put Rovers 5-2 up and surely out of sight. There could have been a sixth before half-time when a loose ball fell to Finbar O’Brien who unleashed a fierce drive which unluckily smashed off the crossbar and out of play. Rovers started the second half on the front foot, Matty Hamilton getting on the ball and controlling play. Brendan and Jack McGonigle both had half chances but that sixth goal still would not come. On 55 minutes an Irish Street defender played a tired looking back pass short which allowed Chris Doyle to nip and nick the ball away from the out-rushing keeper and being taken out for another clear penalty. The Irish Street keeper, being the last man the referee had no choice but to bring out the red card and sent-off the keeper and after dusting himself down Doyle stepped up himself to take the resulting spot-kick and placed it into the substitute keeper’s right hand side. Rovers created chance after chance but often the final decision or wrong pass was made and Irish Street were let off the hook. On 75 minutes Finbar O’Brien came close to adding his second of the game with a well struck effort, which had the keeper beaten, hit the post. 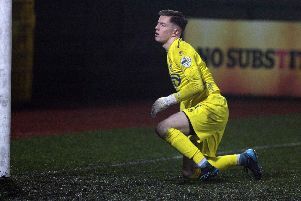 Minutes later Rovers’ final goal of the game arrived when a Jack McGonigle corner from the left found a completely unmarked Conor Mullan who headed home simply into the side of the net. The game petered out slightly from then on as Rovers ran out comfortable 7-2 winners. Credit to Irish Street who struggled from the start but kept pushing till the end.